From the moment you turn onto the private, tree canopied lane and follow it to the end of the ridge, you will be keenly aware you have arrived at a special destination…. Timberview Cabin. Within moments, yesterday’s stresses will be a distant memory. 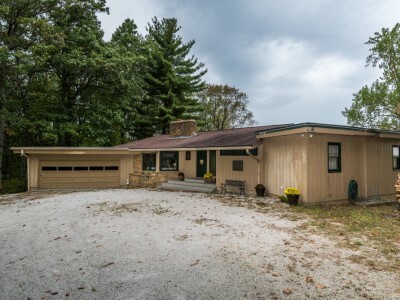 Timberview is easy to find and conveniently located only 2 miles from downtown Nashville and 20 minutes to Bloomington/IU, yet this vacation lodge is private and peaceful. Timberview cabin has three bedrooms, three full bathrooms and a cozy den with a queen bed. This vacation home is perfect for family get-togethers/reunions, ladies only shopping trips and romantic getaways. Timberview cabin is surrounded by beautiful Yellowwood Forest with hiking trails just footsteps away. You will feel your inner-spirit regenerate as you experience this rustic, secluded setting with awe-inspiring views. Take a peek at what Timberview has waiting for you! This rustic vacation home has a wonderful picnic deck and relaxing hot tub. Timberview is located across St. Rd. 46 from the west gate of Brown County State Park. Hike, swim and horseback ride all day in the park. Then enjoy a picnic meal on the spacious deck or relax in the hottub and take in the spectacular view. You may even see a deer at dusk! Gather everyone into the sunken timbered Grand Room for lively conversation or enjoy the 46" flat screen and blu ray player while you savor the fantastic view from your own rocking chair. Then take the night chill off by getting cozy around the mammoth wood burning Brown County stone fireplace. There is a full kitchen and the large dining room table will seat everyone for meals, games and fun! 2 out 3 bedrooms has its own TV. The master bedroom has a DVD player. Hoosier sports fans…this is the place to be after the I.U. game! Timberview has an attached garage “game room” with a pooltable for your enjoyment. This cabin can sleep eight guests. There is a master bedroom, with a bath, There is a queen bedroom with a bath, and, there is a twin bedroom. There is a cozy den with a queen bed, a wonderful view, and a bathroom. Experience the beauty of Brown County and the quaint charm of downtown Nashville with over 250 shops offering all forms of art, crafts, jewelry and antiques. Take in a show at one of the several theaters or take a relaxing drive through Brown County State Park.. Enjoy all that Brown County has to offer from your own quiet, secluded retreat…Timberview Cabin.